You are here: Home / Websites & Blogs / Powerful SEO Basics for Beginners to Get Google Love! Got a blog waiting for readers? You could use some SEO basics! I love Google – they send me a ton of traffic (currently about 3,000 visits each weekday). But I didn’t always! I had to learn how to please the Google gods. I’m not an SEO expert, but these easy SEO tips have really exploded my traffic. Here are some simple SEO basics you can implement for your own blog. Make it easy from the start – a WordPress website is easy for search engines to crawl, and easy for you to update, providing the fresh content Google loves to see. Go WordPress! When you write for your website, you want to be sure the keywords you’re using are the same search terms your potential visitors are using. They’re not looking for “athletic footwear” but perhaps “Nike running shoes.” Use the Google AdWord tool to see what people are really searching for. Or ask your audience! Note: when people say “keyword,” they really mean keyword phrase. I could try to rank for “SEO,” but that could take me a lifetime. The longer phrases will be easier to rank for, especially as you’re getting started. 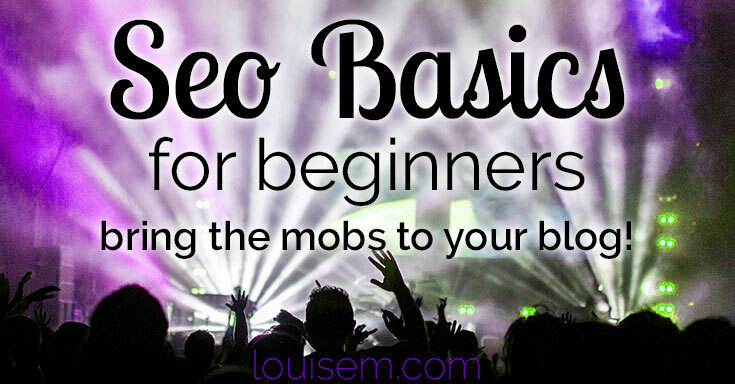 With 9,990 searches a month, “SEO basics” is comfortable for my established blog. If you’re just starting, you might try for phrases well under 1,000 searches a month. The most powerful SEO comes from using your keyword phrase in the title and URL of your post – it’s a must! And having it near the beginning provides the most impact. You might use some descriptors in the title and/or heading that you can edit out of the URL – check this post’s URL, for example. Note that by default, WordPress will give you numbers for your post’s URL. Be sure to change this under Settings –> Permalinks. I use the custom structure “/%post_id%/%postname%”. Whatever you use, you’ll want to be sure it will use your keyword phrase instead of meaningless numbers. Sometimes bloggers have a great title, then write a chatty sort of article that doesn’t use the keyword once. Now Google might not be really sure what your article’s about! I like to use the keyword phrase near the beginning, as well as in the conclusion of the article. I’ll use it in a heading too, if it makes sense. It’s very important to have a readable article, though. If you use the keyword TOO much, Google will penalize you for keyword stuffing. Think quality of article over quantity of keywords. And don’t forget to use your keyword in the meta description, which you can add via a plugin like All In One SEO or Yoast SEO. I gotta say, I think this one has helped me a lot. Some of my posts have a lot of images, and I name them each with keywords separated by hyphens (example: basic-seo-beginners). Also make use of the Alt tag, which is read by the search engines, even though they can’t “see” the image. You can easily add this in WordPress when you upload your image, under Alternate Text. When you have relevant information in another page or post on your site, link to it, using keywords appropriate to the linked article as the anchor text of the link. An easy way to do this is with the WordPress plug-in, Yet Another Related Posts Plugin. What About Social Media for Traffic? Social media is essential, but a topic unto itself. 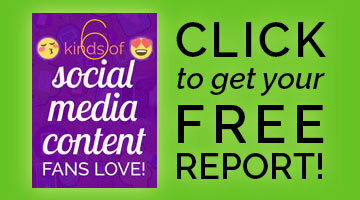 Read this for how social media supports SEO. This is just the tip of the iceberg, to get you off and running. If you found these tips helpful, please share! 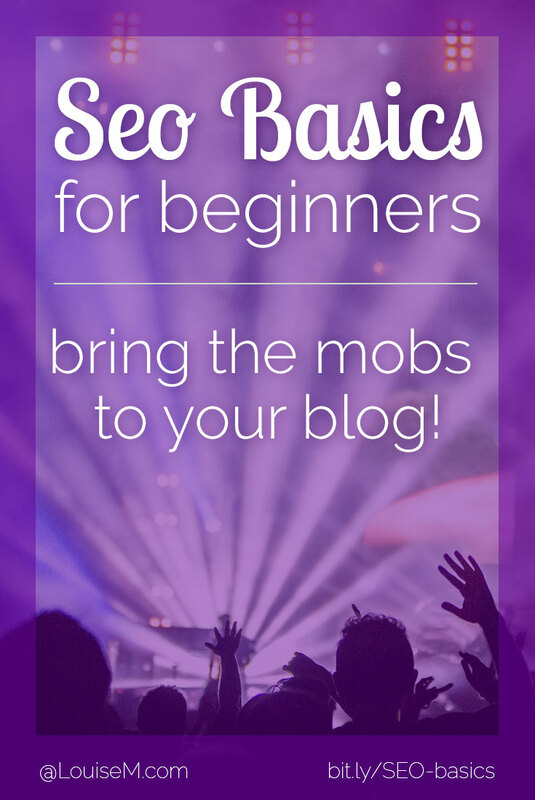 And let me know in the comments if you have more ideas on SEO basics for beginners. Thanks! Wow…! Really interesting topic with some useful suggestions. I’m also using YARP Plugins in wordpress but that’s only listing in bullets that’s not showing list in numbers as I saw this blog. Plz have a look my blog and plz suggest me to change that bullets into numbers and plz will you explain me how this will help us to get more traffic? Hmm, that’s interesting, I don’t see a setting to changer from bullets to numbers. I guess you could ask that on the YARPP forums. The internal linking on your site, using your keywords, helps with SEO. Very basic yet effective tips ! Great article, Louise! The only thing I would add is to include your keyword(s) in the meta description of your post as well, for some additional Google juice. Thanks for sharing. Absolutely Tom! That’s an easy one to do, that I forgot to include. Will add it now. These are all great tips! i’m going over these with a few friends, and you say what I say as well, Louise. Your content and SEO have to marry. You can’t get much traffic from search without them. Nice! Awesome! Thanks for your comment, Elizabeth! I heard just last week that Google no longer allows the use of keyword meta tags; in fact they penalize people that now use them. So how does this relate to your article above? I’ve never used meta tags. Meta description = the description that often shows up with your page in search engine results, or when you share to Facebook or LinkedIn. This is added to your post via a plugin. I’ll try to add a screen shot so you can see. Louise – do you have a preference between Yoast and AIO? I am using the Yoast plugin and have noticed an increase in traffic since I installed it. I did some research online before choosing Yoast. However, there has been one noticeable drawback — I am getting duplicate post titles on my posts. Any suggestions? Yeah, isn’t that the weirdest thing?! I had Yoast on another site and didn’t know how to stop it from doing that. Let me know if you find out, Tom! I believe, Google loves validation too. If you site checks out to pass w3C Markup Validation, it proves a good point in Google’s good books. Thank you so much D’Arcy! I appreciate your comment. Have a great 2013! Use Keywords in the content as well, but do not over-use your keywords or you’ll be categorized by Google as “over-optimized website”. second, If you want to create internal linking it’s better for you to create footer links, it’s good for search engine and users as well if anyone want to navigate directly to a specific page. I’m not certain about the footers. I know SEO expert Jill Whalen would disagree. I recently read her say that Google suspects footer links to be spammy. Definitely don’t overuse keywords though! As per as I know now Google algorithm don’t consider img alt tag’s. But really nice advice. I will use all of it! Hey Hasan, that’s good to know. I’m so happy to hear you found this post useful! Your suggestion for the beginners is very good and yes one must know about the seo basics but no one is perfect. The owners of the website must consider about small things which plays a big role in seo like alt tags for images, proper use of H tags, a good Meta description and co-citation and the blog will get a hike in traffic in this way. Very straightforward and easy-to-understand SEO tips for beginners! Also, produce rich and always fresh content that will elicit more engagement with your target audience — then Google will love you more! Hi Louise, thanks to this post. It really helps me since I am new to the environment and beginning to create a website. The steps are useful to us beginners and applicable . Continue to share post that can help a lot. So happy you found it useful, Andrew. Thanks for visiting! So my question is, do you think it’s possible to create a successful blog just by blogging daily and using SEO? I’m reading mixed reviews from other bloggers, but just wanted to know your thoughts on that. It all depends on what you mean by “successful.” If you mean traffic, then yes. If you mean making a full-time income, that’s much much harder! You have to really know your audience, what they will spend money on, etc etc. I haven’t figured this one out myself!